There are two ways of seeing your results. The results checker and the results reporter. One is more detailed than the other and they both have their uses. The Results checker works as an ‘at a glance’ look at the results. It’s a non-granular look at how the cohort has done and can be used immediately after the exam has finished. 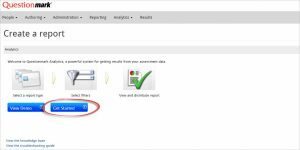 The Results Exporter is the more information heavy of the two, using this will allow you to see an individual students answers to the questions by means of a downloadable report. This report will not be available until the day after the exam has taken place. You will only be able to use this feature the day after your exam has taken place. Scroll to the very bottom of the screen and find the “Generate report: CSV” button. Press this button and you will see your report downloading (Usually your web browser will ask if you would like to save, save as..
You may have had a problematic question during the exam. Follow this link for a guide that shows you how to exclude a question. After you have made a request to schedule your exam, you will see up to two additional emails from us explaining what we have done and what you need to do to ensure that your exam goes ahead accurately and efficiently. We test your exam against our best practice recommendations, the results of which you will see in a future email, but only you can verify that the content in the exam is correct. Once we have created the exam on OnDemand you will receive a link to it. This is for you to test the exam. We expect you to get 100% of the questions correct. If you do not achieve a score of 100% let us know and we can tell you which questions you got wrong and we can work together to rectify any issues. Questions that require essay style answers should always be worth zero so you can mark them, unless, you you would like to use OnDemand’s “on screen marking”. See Why iSolutions does not recommend using OnDemand for essay questions. See Why iSolutions does not recommend using OnDemand for essay questions. Over the past few semesters of using OnDemand we have decided that using it for essay questions has certain issues and has accessibility restraints for students. The OnDemand word processor has no formatting options, cut and paste is not available and students with accessibility needs are not catered for. 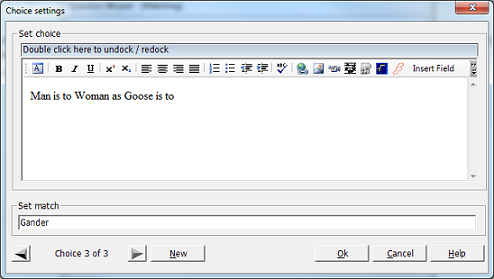 Word has a more robust workflow, from opening the app, to back ups during the exam to final delivery of the work. It is a tried and tested work flow that we have honed over several years. You should expect to receive a number of automated emails from iSolutions when scheduling your exam. This process is designed to ensure that computer-based exams can be checked and processed before the exam timetable has been finalised. We can start preparing your exam as soon as it is ready and then schedule it closer to your exam date without rushing authors to make checks at the last minute. Use this guide to access OnDemand. It allows you to sign into the external, cloud system with your regular Username and Password. If you have never accessed OnDemand before, it will tell you how to request a new account. View a summary page for OnDemand users who had content in QuestionMark Perception or used Authoring Manager to create and edit questions in previous years. — How do I insert the scores from my QM Perception test into Blackboard’s Grade Centre? Import the revised spreadsheet into Grade Centre. The general approach for Step 2 – namely, copying scores from QMP test then pasting them into a new column in the exported Grade Centre spreadsheet – starts with having, in the same spreadsheet, all the relevant QM Perception results in one worksheet and the exported Blackboard Grade Centre in another worksheet. Sort both worksheets by student name, which make it easier to compare them, and then create a new column for your test in the Grade Centre worksheet and give it a suitable name, e.g. ‘Online test’. If you have a small group, say 50 students or less, it is often simplest to select the ‘source’ scores from the QMP worksheet for a group of students using your mouse and then paste them into the relevant ‘target’ column. 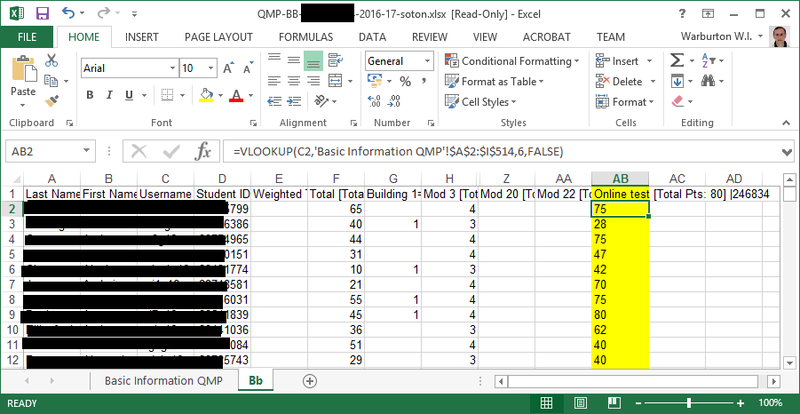 If, on the other hand, you have a large group – or if the two worksheets are difficult to compare due to mismatched student lists, which can happen if students have not been added or removed in Banner, or if there are student absences on the day of the test – then it may be easier to use Excel’s VLOOKUP function to copy the scores over. This may also reduce the risk of transcription errors. We are in the process of upgrading the University’s QuestionMark Perception service. We will do this by creating a new system which will run in parallel with the existing v5.2 legacy system until the migration is complete. We are emailing existing authoring account holders to ask if they wish to use the updated system. When we hear back from authors confirming their wish to use the updated system we will create new accounts for them with the same username, but we may be obliged to create new passwords. Authoring accounts on the updated system (version 5.7) will be made available when the system is ready for use, at which point new assessments will be published and delivered on the new system. We anticipate that the updated system will become available in time for the start of Semester 1 this year, in other words by the end of September 2016. 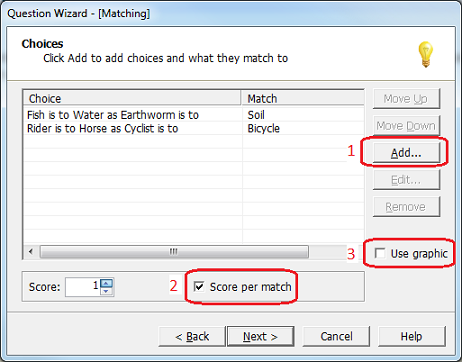 A Matching question presents two series of statements/words, and the participant must match items from one list to items within the other list. Creating a Matching item is a matter of adding a sequence of Choices (stimuli) and Matches (Responses). To add a new Choice, click the ‘Add’ buttion and set a score for its correct response: if you wish to be able to award partial credit, set the option ‘Score per match’. Click ‘Use graphic’ if you wish to use the optional visual enhancement.